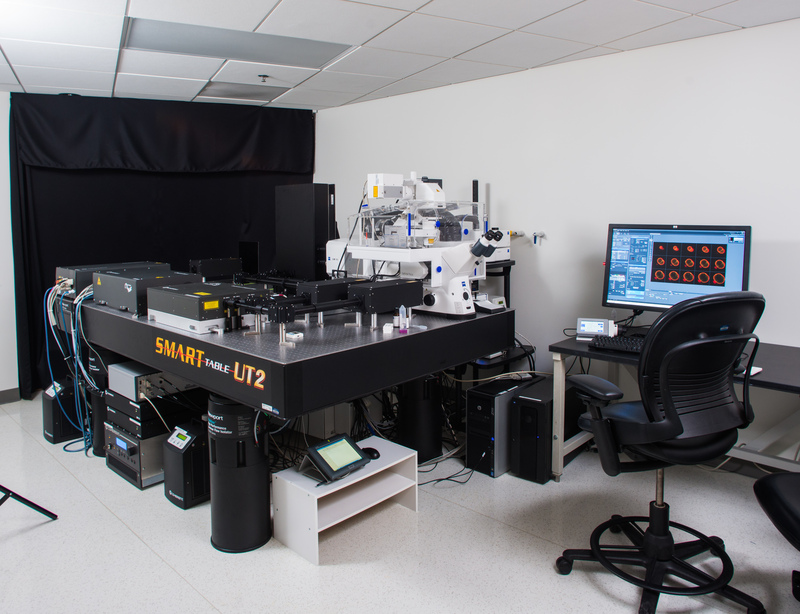 The Stowers Microscopy Center is the home of a lot of mouth watering hardware! 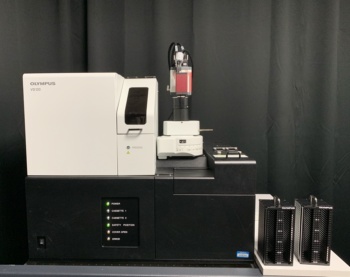 You know... the kind of machines that make you start to drool when you're designing an experiment and considering which microscope will do the job best. Below is a brief summary of the machines that we're lucky enough to work with every day. The LSM-780 OPO is an inverted microscope specially equipped for multiphoton imaging that allows deep tissue penetration. Its advanced detection system has the high sensitivity for fluorescence correlation spectroscopy and single photon counting. The 32+2 detector design (32 channel GaAsP with two side Quasar PMTs) permits a 34 channel readout that for the simultaneous acquisition of up to ten dyes using a combination of up to eight different lasers. There is an additional PMT for a transmitted light channel and DIC imaging. 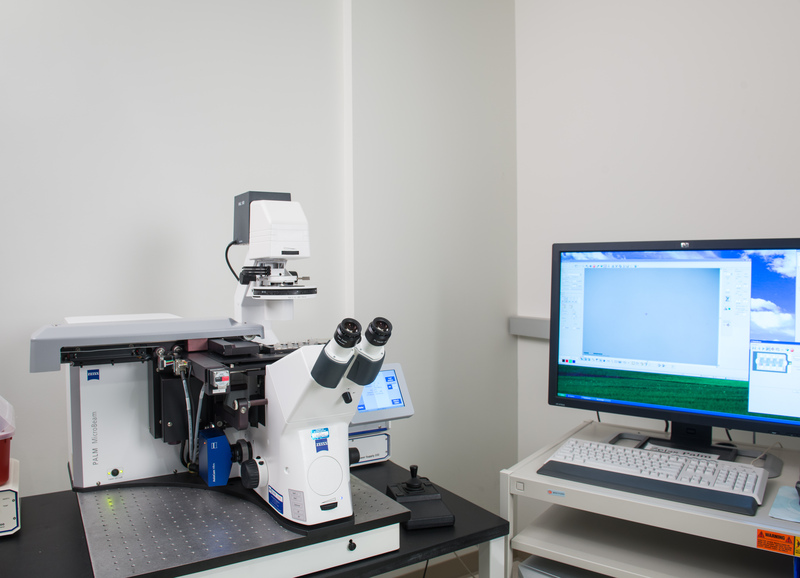 The microscope is equipped with a 835 nm LED auto-focus to compensate for focal drift in long-term or dynamic temperature experiments. It has a motorized scanning stage and is controlled by ZEN software which includes the Experiment Designer module and Tiles & Positions module. Other equipment includes an incubation chamber for temperature control and adjustable CO2. Laser wavelength is extended and tunable to 1600 nm by the Chameleon Compact OPO. 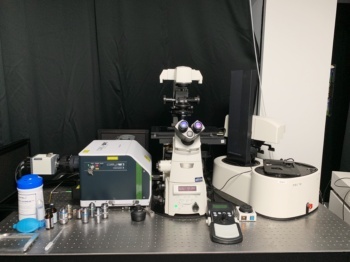 This microscope also has an airy-scan accessory to perform high sensitivity imaging at resolutions beyond the diffraction limit (down to around 140 nm). The Leica SP8 STED is an inverted photon counting confocal microscope specially equipped STED super-resolution imaging. The microscope is equipped with HyD detectors for high resolution and high sensitivity imaging. A white light laser allows for spectrally resolved excitation. STED super-resolution is achieved with a high power near-infra red depletion beam shaped in a doughnut around the confocal beam. Depletion lasers at 775 and 660 nm allow for super-resolution microscopy of different colored fluorophores. The Nikon CSU-W1 is an inverted spinning disk confocal microscope specially equipped for robotic sample loading and scriptable automation. 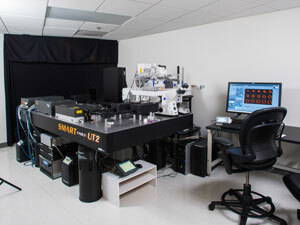 The microscope is equipped with sCMOS and large format EMCCD cameras for high resolution and high sensitivity imaging. Scriptable automation is achieved through the Nikon jobs functionality. The jobs interface is user friendly and has access to the power of the Elements software but also allows for external image processing when necessary. The microscope is equipped with the Nikon perfect focus system to maintain the focus for long term timelapse imaging. The PerkinElmer Ultraview is a spinning disk confocal microscope that allows acquisition of images at very high frame rates with minimum illumination of samples. 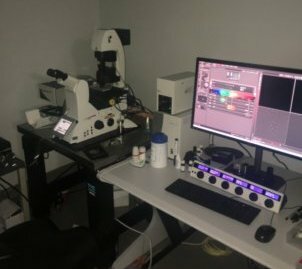 The microscope is equipped with one CCD (ORCA-R2) and one EMCCD (C9100-13) optimized for speed, sensitivity and resolution. 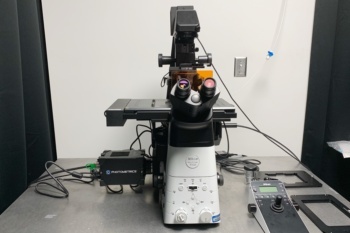 Based on the Yokogawa CSU-X1 Spinning disk scanner, the system provides exceptional speed for live cell fluorescence imaging (up to 32 frames per second). A PhotoKinesis accessory is also available to target concentrated laser illumination onto a user defined region of interest to allow Fluorescence Recovery After Photobleaching (FRAP) and similar experiments. Microscope function and image acquisition are controlled by PerkinElmer Velocity software. The LSM-710 is an upright microscope optimized for performing deep tissue, 2-photon imaging. Spectral imaging is accomplished in parallel via a QUASAR detector. Also attached to the LSM-710 are nine non-descanned detection (NDD) for collecting 2-photon emission and/or second harmonic generated signal, and a GaAsP detector for maximum sensitivity. For long term live imaging an incubator has been added that offers temperature and CO2 control. 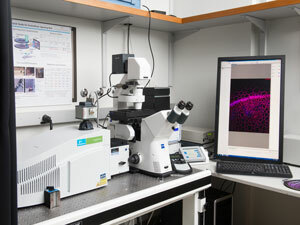 The DeltaVision OMX is an inverted super-solution microscope capable of 3D structured illumination (3D-SIM), ultra-high speed wide-field fluorescent imaging and TIRF Illumination.True 3D structured illumination imaging enables resolution improvements in all axes, 130 nm in XY and 280 nm in Z (wavelength dependent), twice the resolution of conventional imaging techniques. 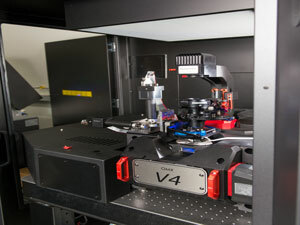 The uniquely designed optical system allows simultaneously acquiring up to three channels at rates > 400 fps (exposures dependent) - critical for high-speed live cell and FRET imaging. Environmental controls provide incubation at 37 degrees with 5% CO2. The Olympus Slide Scanner is an inverted robotic microscope that can make quick work of up to 50 histology slides at one time. It is equipped to perform brightfield and fluorescence imaging in a customizable workflow designed to find tissue sections at low resolution and then image them at higher resolution and multiple modalities. Air objectives are available from 2x to 40x and the system is equipped with a whole slide macro camera to capture slide labels as well. 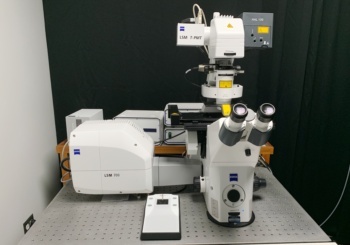 The LSM-700 Falcon is an inverted confocal microscope equipped with PMT detectors and a beam splitter detection scheme for simultaneous dual channel detection. Multi-track detection allows for more complex sequential acquisition. The LSM-700 Upright is the twin of the inverted Falcon above. The upright setup can be useful for sample manipulation during acquisition. The Nikon Ti2 is an motorized widefield microscope equipped with Nikon Perfect Focus technology. As such, it is capable of maintaining focus for long acquisitions. 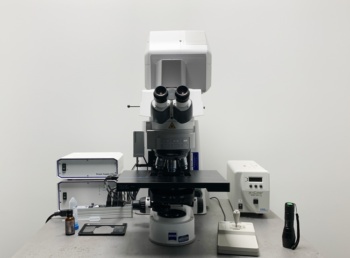 This microscope is also equipped sCMOS camera for high sensitivity acquisition and can take advantage of our two Oko Labs stage top incubators and objective heaters for environment control. 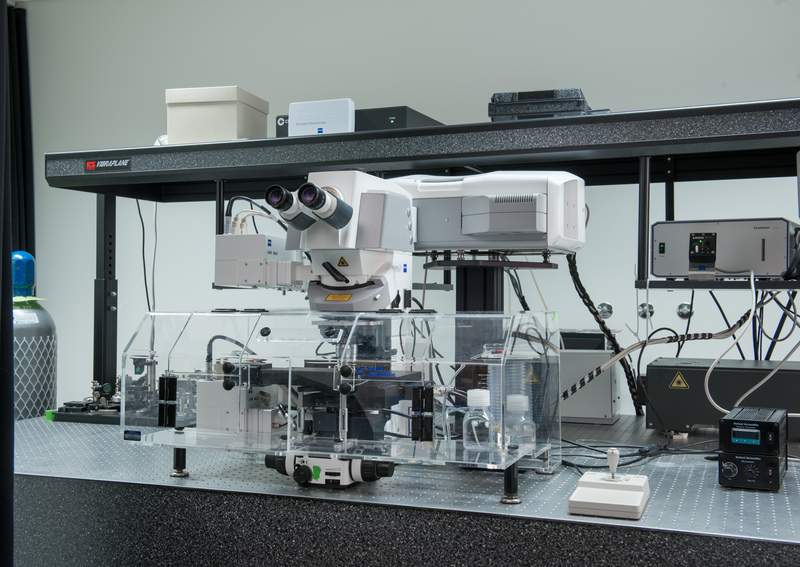 The Zeiss PALM MicroBeam is a widefield system that provides a method for no-contact extraction and capture of cells for biochemical analysis. 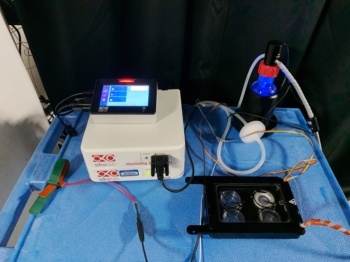 The system uses a fine-focused 355nm pulsed laser to cut-out and extract cell groups, single cells, or even parts of cells, without contamination or heat damage to the sample. PALM-LCM is equipped with a robotic arm that positions a micro-centrifuge tube cap above the stage to capture single or multiple samples once catapulted and can be used on a wide variety of sample types, including live, fixed, fluorescent, and brightfield. 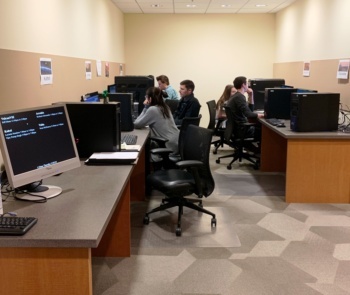 Our Workstations are free to Stowers researchers but please book them so you don't have to fight over access! They are all configured to run Imaris and have at least 64 GB of Ram for opening and processing large images. 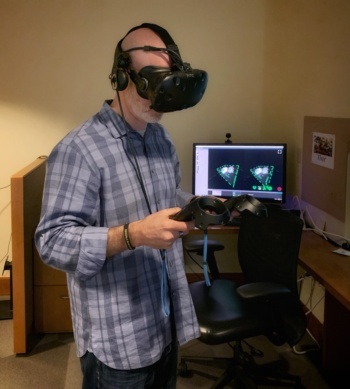 Our VR Room features the Syglass software for interactively annotating 3D scientific data. The okolab incubators along with their associated objective heaters allow for portable environment control anywhere in the microscopy center. We have two of these that are free to use for Stowers researchers--just book them along with your microscope appointment. The cellasic onix2 microfluidic system allows for customizable fluid control. 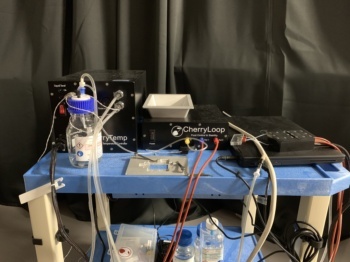 We routinely use it to immobilize yeast for timelapse imaging under varying buffer conditions. 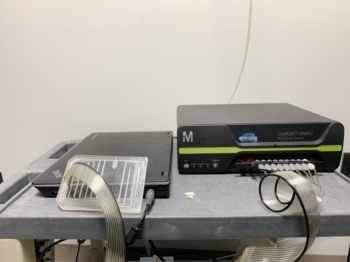 The cherry biotech microfluidic temperature controller allows for blazing fast temperature control (seconds) of a variety of samples from 5 to 45 degrees C. We have used it for heat shock, cold shock, or simply low temperature imaging.